We send our congratulations and thanks to Luna for her project “Horses of Sable Island”! Luna contacted us by email in April 2018 asking permission to print and use an image from our website in a school project. The picture that caught her eye was of the different coats and markings of the Sable Island horse created by Ph.D. student Sarah Medill as a researcher with the McLoughlin Lab in Population Ecology at the University of Saskatchewan (see http://sableislandfriends.ca/?p=594). We were delighted that Luna had used our website for the purposes we had intended – to learn more about this amazing place – and that she wanted to share her learning with others. We checked with Philip at the McLoughlin Lab and he was also thrilled to know that the next generation of scientists is already researching Sable Island and its horses! 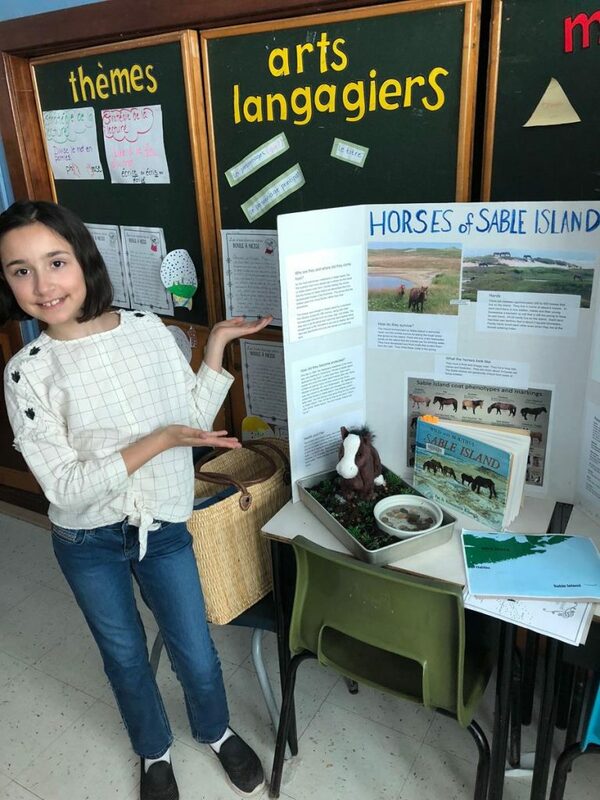 The photo above shows Luna presenting her project at her school’s Heritage Fair and we think it looks thorough and professional, with several information sources in evidence (like Pat & Rosemarie Keough’s book “Wild and Beautiful Sable Island“). This is the best way to ensure the ongoing care and conservation of Sable Island National Park Reserve and its unique flora and fauna. All the information, images and pictures on our website are offered for use by those wishing to help keep Sable Island in the hearts and minds of more people.